The Nigiri Concept: Salmon Habitat on Rice Fields | California Trout, Inc.
Nigiri is a form of sushi with a slice of fish atop a compact wedge of rice. In Yolo County, the “Nigiri Project” is the name of a collaborative effort between farmers and researchers to help restore salmon populations by reintroducing them during winter, to floodplains that are farmed with rice during summer. Today, only five percent of the Central Valley’s original floodplain habitat remains for the region’s salmon populations. 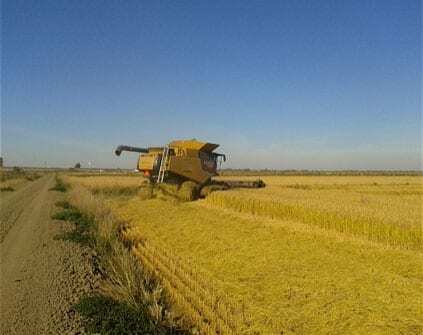 The Nigiri Project seeks to optimize habitat benefits for salmon and water birds, while maintaining farming on the largest floodplain of the Sacramento-San Joaquin Delta, the 60,000-acre Yolo Bypass. Given its importance for flood protection and habitat, the Yolo Bypass is a focus of numerous planning efforts. A directive to improve salmon habitat on Yolo Bypass is part of the “biological opinions” to operate state and federal water projects in the Delta. The Bay Delta Conservation Plan, led by state and federal agencies, aims to improve both water supplies and the estuary’s struggling ecosystem by improving infrastructure and habitat on Yolo Bypass. 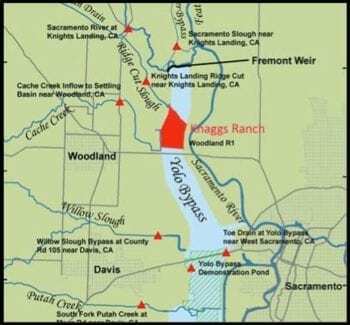 The Central Valley Flood Protection Plan, led by the Department of Water Resources, is focused on increasing flood capacity in the bypass. By pursuing both floodplain science and Yolo Bypass infrastructure improvements, the Nigiri Project provides the foundation to accommodate all of these goals. The Knaggs Ranch Experimental Agricultural Floodplain Habitat Investigation is the science arm of the Nigiri Project and includes a controlled pilot project designed to determine which agricultural practices maximize benefits to salmon. During winter 2012-13, 53,000 juvenile salmon will be reared on 25 acres of harvested fields to allow researchers to test behavior and growth rates of young salmon on agricultural floodplains. Research will also determine if long-term survival rates of salmon are improved by increasing the time they spend on floodplains. Results from the 2012 season showed the potentially dramatic benefits of allowing salmon to access floodplain habitat. In February, about 10,000 salmon fry were released onto five acres of inundated rice field on the Knaggs Ranch during the non-growing season. They were measured and tagged to study habitat preferences and growth rates. Researchers from UC Davis and the California Department of Water Resources re-measured many of the fish six weeks later as the field was drained, sending the salmon on their downstream migration toward the Delta and the Pacific Ocean. The five-fold weight gain in only six weeks was among the highest growth rates recorded in Delta salmon research.